Guide to resources in Mechanical Engineering. Collections in the Engineering, Mathematics Statistics, Physics-Astronomy, and Chemistry libraries can be discovered by searching the OskiCat catalog. When accessing a library licensed resource via links found on OskiCat, Start your Search, or our Databases A-Z list, you will be prompted to authenticate via CalNet or via your PIN / Cal 1 card number. If you normally search via non-licensed UCB resources (such as Google Scholar), you may need to install our bookmarklet in order to authenticate. Note: EZProxy will replace the library's previous proxy solution. More information on EZProxy can be found on our EZProxy guide. After you install and run the VPN client software on your computer, you can log in with a CalNet ID to establish a secure connection with the campus network. If Berkeley does not own a publication, you can borrow it from an external library by requesting an interlibrary loan. This is a free service to Berkeley faculty, staff, and students. The average wait for an ILL request is one week but items borrowed from out-of-state take longer to arrive. To make an interlibrary loan request for a book, use the Request button in Melvyl, which searches many libraries worldwide. A copy will be delivered to the campus library of your choice for pick up. For journal articles and conference papers, it is best to make an order through the Interlibrary Borrowing Service request form. We will email you a PDF copy of the paper. 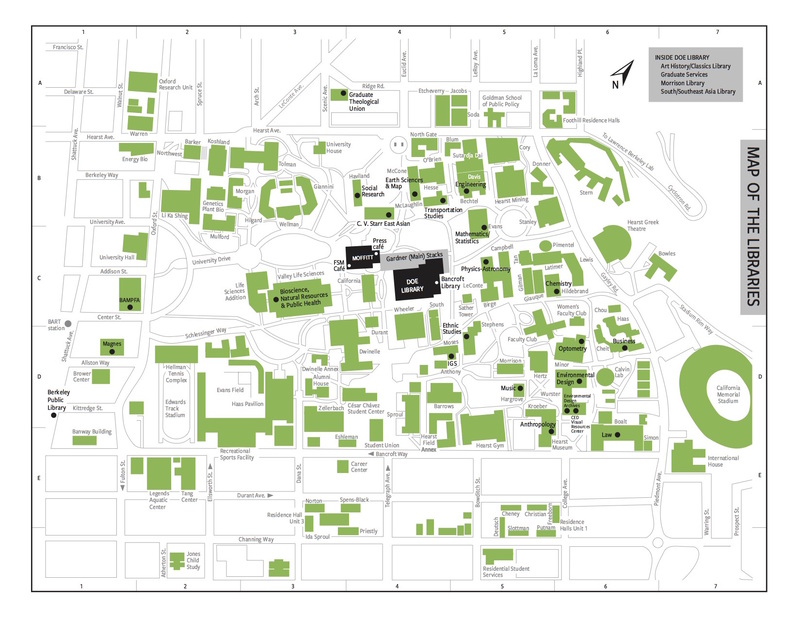 Select the image below to see the full campus library map.